"We choose to go to the Moon" is the famous tagline of a speech about the effort to reach the Moon delivered by United States President John F. Kennedy to a large crowd gathered at Rice Stadium in Houston, Texas on September 12, 1962. The speech was intended to persuade the American people to support the Apollo program, the national effort to land a man on the Moon. The speech resonated widely and is still remembered, although at the time there was disquiet about the cost and value of the Moon-landing effort. Kennedy's goal was realized in July 1969, with the successful Apollo 11 mission. When John F. Kennedy became President of the United States in January 1961, many Americans perceived that the United States was losing the Space Race with the Soviet Union, which had successfully launched the first artificial satellite, Sputnik 1, almost four years earlier. The perception increased when, on April 12, 1961, Russian cosmonaut Yuri Gagarin became the first man in space before the U.S. could launch its first Project Mercury astronaut. American prestige was further damaged by the Bay of Pigs fiasco five days later. Convinced of the political need for an achievement which would decisively demonstrate America's space superiority, Kennedy asked his Vice President, Lyndon B. Johnson, in his role as chairman of the National Aeronautics and Space Council, to identify such an achievement. He specifically asked him to investigate whether the United States could beat the Soviet Union in putting a laboratory in space, or orbiting a man around the Moon, or landing a man on the Moon, and to find out what such a project would cost. Johnson consulted with officials of the National Aeronautics and Space Administration (NASA). Its new Administrator, James E. Webb, told him that there was no chance of beating the Russians to launching a space station, and it was uncertain as to whether NASA could orbit a man around the Moon first, so the best option would be to attempt to land a man on the Moon. This would also be the most expensive option; Webb believed it would require $22 billion to achieve it by 1970. Johnson also consulted with Wernher von Braun; military leaders, including Lieutenant General Bernard Schriever; and three captains of industry: Frank Stanton from CBS, Donald C. Cook from American Electric Power, and George R. Brown from Brown & Root. 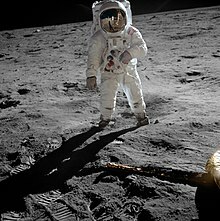 Kennedy stood before Congress on May 25, 1961, and proposed that the US "should commit itself to achieving the goal, before this decade is out, of landing a man on the Moon and returning him safely to the Earth." Not everyone was impressed; a Gallup Poll indicated that 58 percent of Americans were opposed. Kennedy's goal gave a specific mission to NASA's Apollo program. This required the expansion of NASA's Space Task Group into a Manned Spacecraft Center. Houston, Texas was chosen as the site, and the Humble Oil and Refining Company donated the land during 1961, with Rice University as an intermediary. Kennedy took a two-day visit to Houston in September 1962 to view the new facility. He was escorted by astronauts Scott Carpenter and John Glenn, and shown models of the Gemini and Apollo spacecraft; he also viewed the Mercury spacecraft, in which Glenn had made America's first orbital flight. He took advantage of the opportunity to deliver a speech to drum up support for the nation's space effort. Initial drafts of the speech were written by Ted Sorensen, with changes by Kennedy. We choose to go to the Moon! We choose to go to the Moon...We choose to go to the Moon in this decade and do the other things, not because they are easy, but because they are hard; because that goal will serve to organize and measure the best of our energies and skills, because that challenge is one that we are willing to accept, one we are unwilling to postpone, and one we intend to win, and the others, too. The joke referring to the Rice–Texas football rivalry was handwritten by Kennedy into the speech text, and is the part of the speech remembered by sports fans. Since then, Rice has beaten Texas in 1965 and 1994. Later in the speech Kennedy also made a joke about the heat. The jokes elicited cheers and laughter from the audience. While these side comments may have diminished the rhetorical power of the speech, and do not resonate outside Texas, they stand as a reminder of the part Texas played in the space race. Kennedy's speech used three strategies: "a characterization of space as a beckoning frontier; an articulation of time that locates the endeavor within a historical moment of urgency and plausibility; and a final, cumulative strategy that invites audience members to live up to their pioneering heritage by going to the Moon." When addressing the crowd at Rice University, he equated the desire to explore space with the pioneering spirit that had dominated American folklore since the nation’s foundation. This allowed Kennedy to reference back to his inaugural address, when he declared to the world "Together let us explore the stars". When he met with Nikita Khrushchev, the Premier of the Soviet Union in June 1961, Kennedy proposed making the Moon landing a joint project, but Khrushchev did not take up the offer. There was rhetorical opposition in the speech to extending the militarization of space. Kennedy verbally condensed human history to fifty years, in which "only last week did we develop penicillin and television and nuclear power, and now if America's new spacecraft succeeds in reaching Venus [Mariner 2], we will have literally reached the stars before midnight tonight." With this extended metaphor, Kennedy sought to imbue a sense of urgency and change in his audience. Most prominently, the phrase "We choose to go to the Moon" in the Rice speech was repeated three times consecutively, followed by an explanation that climaxes in his declaration that the challenge of space is "one that we are willing to accept, one we are unwilling to postpone, and one which we intend to win." Considering the line before rhetorically asked the audience why they choose to compete in tasks that challenge them, Kennedy highlighted here the nature of the decision to go to space as being a choice, an option that the American people have elected to pursue. Rather than claim it as essential, he emphasized the benefits such an endeavor could provide – uniting the nation and the competitive aspect of it. As Kennedy told Congress earlier, "whatever mankind must undertake, free men must fully share." These words emphasized the freedom enjoyed by Americans to choose their destiny rather than have it chosen for them. Combined with Kennedy's overall usage of rhetorical devices in the Rice University speech, they were particularly apt as a declaration that began the American space race. Kennedy was able to describe a romantic notion of space in the Rice University speech with which all citizens of the United States, and even the world could participate, vastly increasing the number of citizens interested in space exploration. He began by talking about space as the new frontier for all of mankind, instilling the dream within the audience. He then condensed human history to show that within a very brief period of time space travel will be possible, informing the audience that their dream is achievable. Lastly, he uses the first-personal plural "we" to represent all the people of the world that would allegedly explore space together, but also involves the crowd. Kennedy attending a briefing at Cape Canaveral on September 11, 1962. With him in the front row are (from left) NASA administrator James Webb, Vice President Lyndon Johnson, NASA Launch Center director Kurt Debus, Lieutenant General Leighton I. Davis and Secretary of Defense Robert McNamara. Paul Burka, the executive editor of Texas Monthly magazine, a Rice alumnus who was present in the crowd that day, recalled 50 years later that the speech "speaks to the way Americans viewed the future in those days. It is a great speech, one that encapsulates all of recorded history and seeks to set it in the history of our own time. Unlike today’s politicians, Kennedy spoke to our best impulses as a nation, not our worst." Ron Sass and Robert Curl were among the many members of the Rice University faculty present. Curl was amazed by the cost of the space exploration program. They recalled that the ambitious goal did not seem so remarkable at the time, and that Kennedy's speech was not regarded as so different from one delivered by President Dwight D. Eisenhower at Rice's Autry Court in 1960; but that speech has long since been forgotten, while Kennedy's is still remembered. The speech did not stem a rising tide of disquiet about the Moon landing effort. There were many other things that the money could be spent on. Eisenhower declared, "To spend $40 billion to reach the Moon is just nuts." Senator Barry Goldwater argued that the civilian space program was pushing the more important military one aside. Senator William Proxmire feared that scientists would be diverted away from military research into space exploration. A budget cut was only narrowly averted. Kennedy gave a speech to the United Nations General Assembly on September 20, 1963, in which he again proposed a joint expedition to the Moon. Khrushchev remained cautious about participating, and responded with a statement in October 1963 in which he declared that the Soviet Union had no plans to send cosmonauts to the Moon. However, his military advisors persuaded him that the offer was a good one, as it would enable the Soviet Union to acquire American technology. Kennedy ordered reviews of the Apollo project in April, August and October 1963. The final report was received on November 29, 1963, a week after Kennedy's assassination. The idea of a joint Moon mission was abandoned after Kennedy's death, but the Apollo Project became a memorial to him. His goal was fulfilled in July 1969, with the successful Apollo 11 Moon landing. This accomplishment remains an enduring legacy of Kennedy's speech, but his deadline demanded a necessarily narrow focus, and there was no indication of what should be done next once it was achieved. Apollo did not usher in an era of lunar exploration, and no further missions were sent to the Moon after Apollo 17 in 1972. Subsequent planned Apollo missions were cancelled. The Space Shuttle and International Space Station projects never captured the public imagination the way the Apollo Project did, and NASA would struggle to realize its visions with inadequate resources. Ambitious visions of space exploration were proclaimed by Presidents George H. W. Bush in 1989, George W. Bush in 2004 and Donald J. Trump in 2017, but the future of the American space program remains uncertain. ^ a b Logsdon 2011, p. 29. ^ Young, Silcock & Dunn 1969, p. 109. ^ Jordan 2003, p. 209. ^ a b Young, Silcock & Dunn 1969, pp. 109–112. ^ "Excerpt from the 'Special Message to the Congress on Urgent National Needs'". NASA. May 24, 2004. Retrieved May 24, 2015. ^ Young, Silcock & Dunn 1969, p. 162. ^ Jordan 2003, p. 211. ^ a b Keilen, Eugene (September 19, 1962). "'Visiting Professor' Kennedy Pushes Space Age Spending" (PDF). The Rice Thresher. p. 1. Retrieved March 11, 2018. ^ abigailmalangone (2017-09-12). "We Choose to Go to the Moon: The 55th Anniversary of the Rice University Speech". The JFK Library Archives: An Inside Look. Retrieved 2019-01-06. ^ a b c d Boyd, Jade (August 30, 2012). "JFK's 1962 Moon Speech Still Appeals 50 Years Later". Rice University. Retrieved March 20, 2018. ^ a b c "John F. Kennedy Moon Speech – Rice Stadium". NASA. Retrieved March 19, 2018. ^ Davis, Brian (September 8, 2015). "Now 53 years later, JFK asks, 'Why does Rice play Texas?'". Austin American-Statesman. Retrieved March 20, 2018. ^ Feigen, Jonathan (September 10, 2015). "When Rice beat Texas: October 16, 1994". Houston Chronicle. Retrieved March 20, 2018. ^ Hightower, Brantley (April 20, 2016). "Why Does Rice Play Texas?". Medium. Retrieved March 20, 2018. ^ a b Jordan 2003, p. 214. ^ "Inaugural Address, 20 January 1961". John F. Kennedy Presidential Library & Museum. Retrieved March 11, 2018. ^ a b c d Logsdon 2011, p. 32. ^ Kennedy, John. "Rice University, 12 September 1962". John F. Kennedy Presidential Library and Museum. Retrieved March 10, 2018. ^ Jordan 2003, pp. 217–218. ^ Kennedy, John. "Special Message to Congress on Urgent National Needs, May 25, 1961". John F. Kennedy Presidential Library and Museum. Retrieved March 10, 2018. ^ Jordan 2003, pp. 219–220. ^ Jordan 2003, pp. 220–221. ^ Jordan 2003, p. 224. ^ Young, Silcock & Dunn 1969, p. 197. ^ Young, Silcock & Dunn 1969, pp. 197–198. ^ "Address at 18th U.N. General Assembly". John F. Kennedy Presidential Library & Museum. 20 September 1963. Retrieved March 11, 2018. ^ Young, Silcock & Dunn 1969, pp. 202–207. ^ a b Glass, Andrew (September 20, 2017). "JFK Proposes Joint Lunar Expedition with Soviets, September 20, 1963". Politico. Retrieved March 19, 2018. ^ Logsdon 2011, p. 33. Jordan, John W. (Summer 2003). "Kennedy's Romantic Moon and Its Rhetorical Legacy for Space Exploration". Rhetoric and Public Affairs. 6 (2): 209–231. ISSN 1094-8392. JSTOR 41940312. Logsdon, John M. (Spring 2011). "John F. Kennedy's Space Legacy and Its Lessons for Today". Issues in Science and Technology. 27 (3): 29–34. ISSN 0748-5492. JSTOR 43315485. Young, Hugo; Silcock, Bryan; Dunn, Peter M. (1969). Journey to Tranquility. London: Jonathon Cape. DeGroot, Gerard (2008). The Dark Side Of The Moon: the Magnificent Madness of the American Lunar Quest. London: Vintage Books. ISBN 978-1-84413-831-9. OCLC 438328453. Launius, Roger D. (2011). After Apollo: The Legacy of the American Moon Landings. New York: Oxford University Press. ISBN 978-0-230-11010-6. OCLC 707157323. Logsdon, John M. (2011). John F. Kennedy and the Race to the Moon. Basingstoke: Palgrave Macmillan. ISBN 978-0-230-11010-6. OCLC 707157323. Wikimedia Commons has media related to Address at Rice University on the Nation's Space Effort. 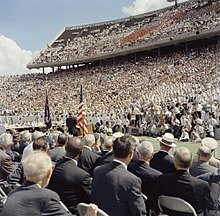 "John F. Kennedy Moon Speech – Rice Stadium". Johnson Space Center. Retrieved March 19, 2018. Transcript and video of the speech. "Address at Rice University, Houston, Texas, 12 September 1962". John F. Kennedy Presidential Library and Museum. Retrieved March 19, 2018. Drafts of the speech, with hand-written additions by Kennedy.